Announcer #1: Welcome back, folks! 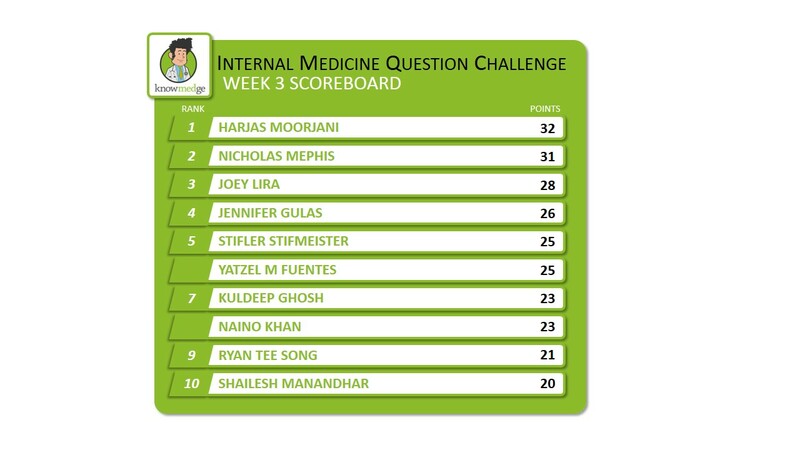 We’ve just wrapped up Week 3 of the Knowmedge Internal Medicine Question Challenge and let me begin by saying that it’s been a real nail-biter! Announcer #2: (Chuckling) That’s right! This past week’s scoreboard says it all – it came down to the final question as our top competitors demonstrated their proficiency in the field of Neurology. Harjas Moorjani proved that his performance during Week 2 was no fluke, as he secured the top spot of Week 3. 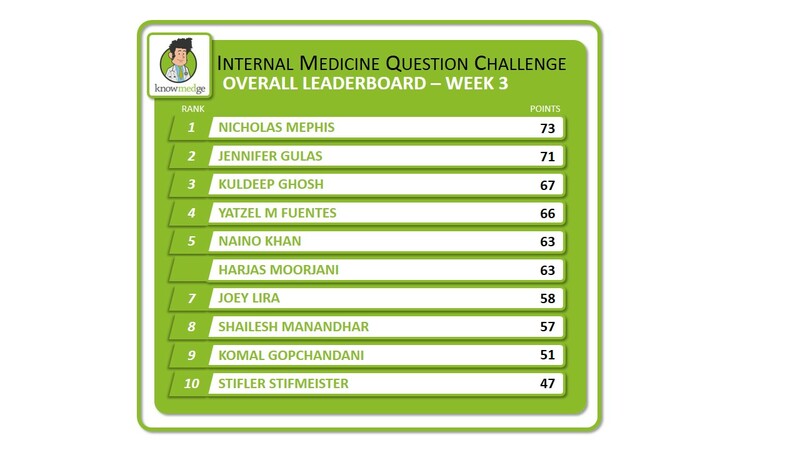 Announcer #1: With just one more week left in the Knowmedge Internal Medicine Question Challenge, who do we see on the Overall Leaderboard at this point? Announcer #2: Well, let’s take a look as it pulls up below. Nicholas Mephis currently holds the top spot, maintaining a slight lead over last week’s leader, Jennifer Gulas. Nicholas has really stormed back into this race over the past week. His gutsy performance manifested in securing the first correct answer on 3 questions this past week. Dare I say, he has been like a hawk! If there’s one thing I can guarantee heading into the final week, it’s that the final result will come down to the wire. The frequent lead changes we’ve witnessed over the past 3 weeks highlight the depth of the talent and intelligence across all our participants. Announcer #1: Week 4 officially kicks off in a couple of hours and we’ll see the course shift to cover Rheumatology/Orthopedics. At the end of the week, we’ll be awarding a free 3-month subscription to the top overall performer and also announcing the results of our raffle to see who wins a free 1-month subscription to the Knowmedge Internal Medicine Question Bank featuring 900+ practice questions. Announcer #2: So keep participating! The more points you earn, the better your chance of winning! And there’s no better way then Liking and Sharing the daily question post to earn extra points. Announcer #1: If you’re just joining us, check out the details of the Knowmedge Internal Medicine Question Challenge here to get started! Be sure to catch up on all the excitement from Week 1 and Week 2 performances. Signing off for now, tune in next week for the final results!